Discusion lifelink & cards with similar ability. - Wagic, the Homebrew !? 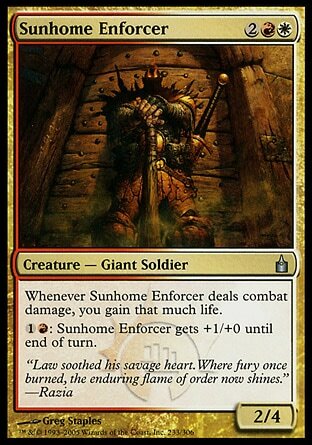 Sunhome Enforcer does not have likelink! Read the card! I would hate to see all those cards removed but the rules aren't the same for lifelink and this ability due to the stack o gain life, lifelink doesn't stack, the other one does. Re: Discusion lifelink & cards with similar ability. It isn't currently possible to code the cards this way 100%. The M10 rules rewrite made lifelink a static ability to make damage assignment easier. I'm not sure what the priority is but I think it works close enough that we can move on to other abilities that haven't been coded. this is true, this static wording has been given the real keyword and are treated as lifelink. the only case where it is not like this, is cards dealing with only combat damage.